Italy's Ivan Basso has denied doping, the day after he admitted he was involved in the Operation Puerto blood doping scandal. Basso said he gave a blood sample to Eufemiano Fuentes, the doctor at the heart of the case, with the intention of doping - but never actually did. "I have not done anything illegal," said Giro d'Italia champion Basso. "It was a moment of weakness on my part. "I've never taken any doping substance or undergone any illegal transfusions." 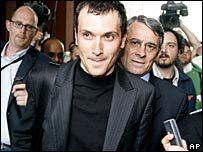 Basso, 29, said on Monday that he would cooperate fully with the anti-doping prosecutor of the Italian Olympic Committee (CONI). And speaking at a news conference on Tuesday, Basso said: "I did admit having attempted to use doping for the (2006) Tour de France and I am ready to pay the penalty for that. "All my wins have been achieved in a proper and clean manner and I have every intention of returning to action and continuing with the job I love once I have paid the penalty." Last week Basso quit the Discovery Channel team after CONI had called him to a hearing to answer doping charges. Basso is one of dozens of riders implicated in the doping affair but he added that he had not named any other cyclists in his discussions with the doping authorities. "The details are in the papers of CONI and cannot be made public," he said. "I was not asked the name of any other cyclists involved. "Only I spoke and exclusively about my position." He was excluded from last year's Tour de France because his name appeared on a list of cyclists who allegedly had contact with a Spanish doctor accused of running a blood doping clinic in Madrid. He was cleared of involvement by the Italian Olympic Committee and the Italian cycling federation in October. But CONI reopened their investigation after unearthing new evidence. Last year's Tour de France also ended in controversy when American winner Floyd Landis tested positive for testosterone.